A classic Easter product from Lush, Golden Egg is a beautiful bath melt that turns your bath water into a sparkly tub of gold (the shimmers are seaweed-based and plastic-free). With a sweet orange caramel-y candy scent, the egg is made with cocoa butter, which really nourishes and softens the skin. The egg surprisingly leaves only very little mess in the tub. However, the egg I got looks a lot less glittery compared to the ones I've see on social media. A super fun blue and pink bath bomb, Humpty Dumpty has a soft citrus scent. I think this is actually supposed to be shaped like a cute egg man with a bow tie but the one I got was kind of an amorphous ball. The bath bomb had some serious fizz when I dropped it into the bath, making it super fun to just watch as it disintegrates into bubbles while streaking around the tub. Now this supposedly had a fried egg design on the inside (see video below), but I totally wasn't aware of this surprise and dropped it directly into the tub without getting to see the cute design inside. 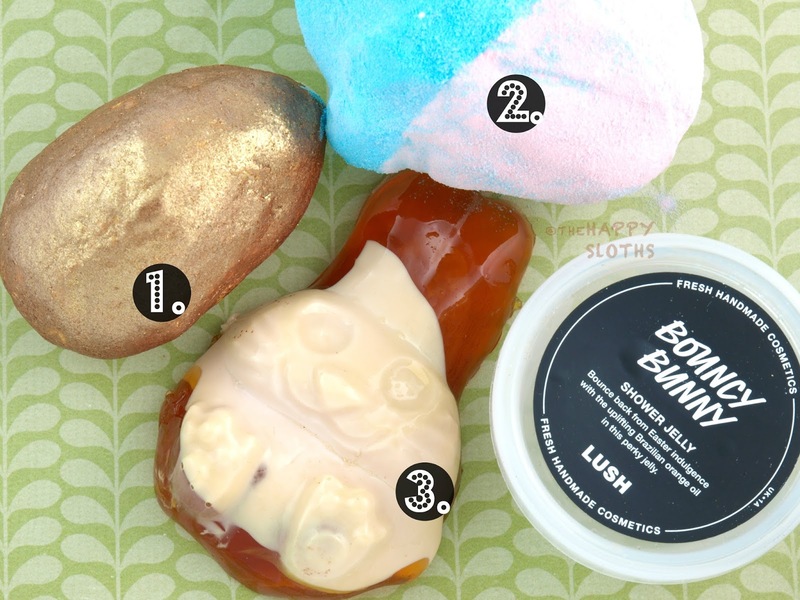 A shower jelly shaped like a cute rabbit, Bouncy Bunny lathers up in the shower, providing some rich bubbles and a refreshing citrus-y scent. Although I prefer liquid shower gels from Lush over these shower jellies, the design is too cute to not love. Check out a slow-motion video I made of me poking the bunny's squishy belly, haha. Lush Easter 2016 Collection is available online and in stores now.